I was struck last week by the realization that I hadn’t done long division in decades. When the Casio FX (can’t remember which; it was small and solar) hit my life, the need to do long division vanished. So it’s probably around 30 years since I last had to do it. This might be a slightly odd way of doing it, but it’s the way we were taught. If you haven’t seen The Danish Poet, you should. I had some time to kill on Thursday evening, so went into the Mediatheque. I’d heard that the animation had won an oscar, so I looked it up. It’s a really sweet (if extremely convoluted) story of true love and Scandinavian coincidences. Congratulations on winning the best animated short with Ryan. 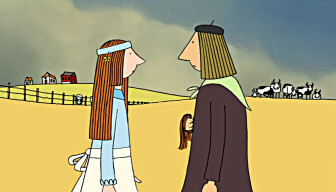 Author scrussPosted on 02005-02-27 Categories o canadaTags animation, nfb, oscar, yayLeave a comment on Yay Chris Landreth! 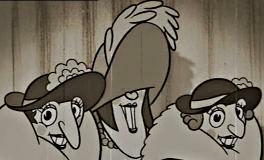 Ah, how I love The Triplets of Belleville. I was brought up on a steady stream of Jacques Tati and Django Reinhardt, so it’s natural that I get along with this film very well. Especially since I scored a region-free copy in the UK. I can live with it being called Belleville Rendez-vous on the box. It was robbed of an oscar. Finding Nemo was an amusing little merchandising platform, but ToB is genius. But what chance did a joint French-Canadian production have in a US-based competition? Go and see this. Best animation I’ve seen in a long time; it’s edging out “Spirited Away” for me. Fabulous score, and many wonderful tips o’ the beret to C20th French popular culture. The Belleville residents look like refugees from The Quigmans. The structural gangsters in their 2CV limos are both menacing and comic. Oh yeah, and stay for the end of the credits.